Some people might tell you not to go to college. Don't listen to them. As you can see, male college graduates make about twice as much every year as male high school grads. 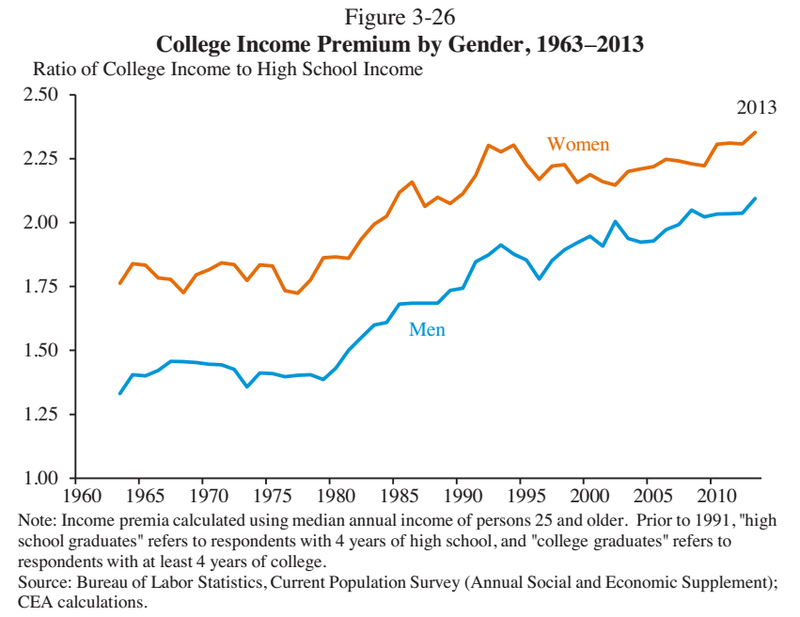 The effect is even stronger for women: Female college grads make about 2.25 times as much as high school grads. That is mainly because less-educated women are penalized a lot more than less-educated men. As you can also see from the chart, the income gap between people who graduated from college and people who didn't has exploded since about 1980, which also happens to be about the same time middle-class wages started to stagnate and income inequality was starting to yawn wider. Despite these problems, college is still worth it. As you can see from the chart above, wage growth has been lousy for everybody since the Great Recession, but it has been much worse for people without college degrees. Updated to add one huge caveat: People who started but did not finish college seem to have suffered worse income declines than anybody else, according to this chart. Not exactly sure why that would be, and that certainly makes student-loan debt more onerous. Still, you can't finish college if you never start it. The answer is not to tell kids to skip college -- the answer is to make college more accessible to everybody.